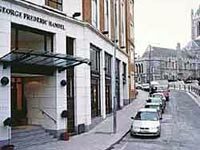 George Frederic Handel Hotel is located on one of Dublin’s oldest streets and it is a fine hotel just like the music composed by Handel from whom the hotel takes its name. Handel’s Messiah was performed for the first time in 1742 right on the site of the hotel. The hotel is adjacent to Christ Church Cathedral which is also steeped in history. The staff in the hotel work very hard to ensure that the guest will have a very enjoyable stay in this historic and proud hotel. The hotel provides elegantly decorated, bright spacious bedrooms and the furnishings and colour schemes were designed with a peaceful nights sleep in mind. The rooms come equipped with all facilities necessary for convenience and comfort. Facilities include a TV, direct dial telephones, tea and coffee making facilities, mini fridges and hair dryers. The hotel also offers an extended room service and a full laundry service which greatly add to the pleasure of a hotel stay. The hotel does not have its own car parking facilities but the staff will advise on all the parking facilities in the area. The hotel also provides facilities for people with special requirements. The guest will find wining and dining in the Karma bar in The George Frederick hotel a very pleasant and exciting experience. The Karma Bar in the hotel is a very popular bar with a pleasant exciting pub atmosphere. During the day this bar is ideal for meeting friends and enjoying the drink and the chat. At night the bar transforms into a buzzing night spot with weekend DJ entertainment and the rest of the week there is popular contemporary music. An ideal night time entertainment venue providing the combination of great music, great drinking and tasty bar snacks. Located on the edge of Temple Bar which is Dublin’s cultural quarters. An area made up of 28 acres and it is a picturesque area comprising of quaint cobblestone streets, beautiful unusual shops, cafes, restaurants, bars and night clubs. Temple Bar has an amazing pub culture including great pubs like Eamonn Doran’s in Crown Alley offering music seven nights a week and many more. The George Frederic Handel is close to Grafton Street, St Stephens Green and Henry Street where excellent shopping can be enjoyed. The major tourist attractions like Trinity College, The National Gallery and The national Museum are all close by.